Sunny and Warm, Water Temperature 77* and Clear. I picked Dwayne and Terry at 5:15 then went and filled my bait tank up with beautiful baits. I then ran to a 30 foot flat with some humps and flats rising to 8 feet and put out a spread of boards. Before I knew it we started hooking up and by 7am the guys did not know what hit them. What a good way to wake up, at first light everything I had out had been hit. The guys were fighting doubles and other fish were on but they could not do anything with them. 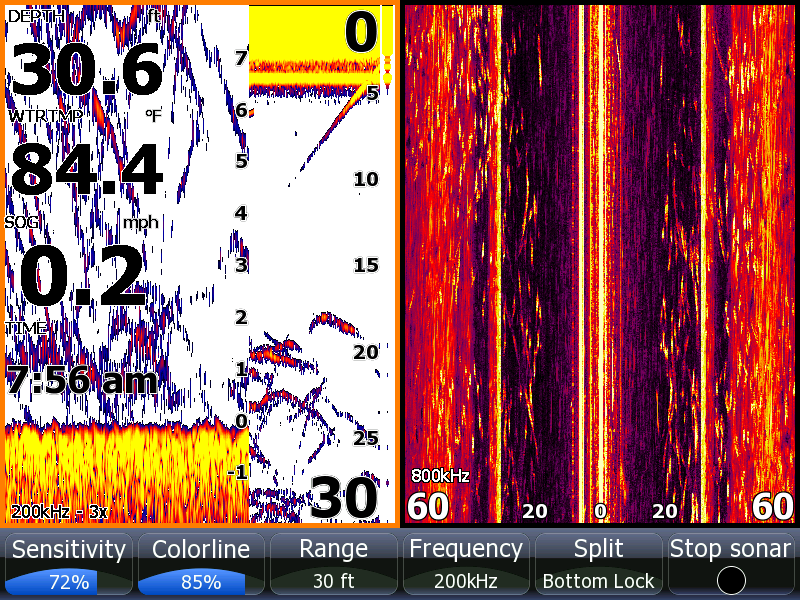 Everyone was running around the boat, fish all over the floor, but it was very organized and the guys did a great job. 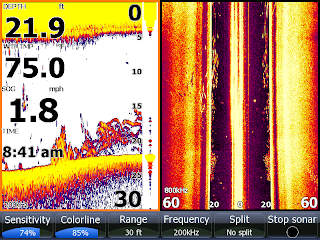 I rebaited all the rods while I was turning the boat around and at the same time the guys were taking fish off the hooks and feeding me rods to bait. 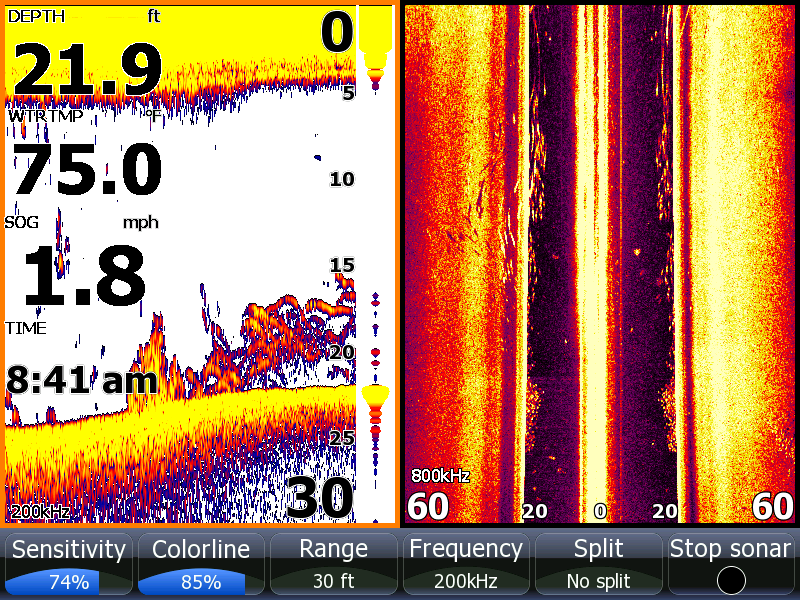 We hit the area again but only had a few hits, the fish had moved on. 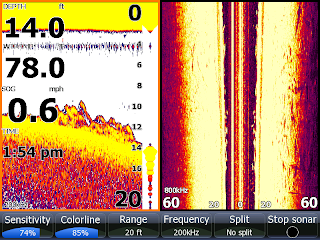 We fished for a while then caught 50 more baits and fished the rest of the day.We got caught in a major downpour and was unable to take a picture of the fish but I did catch some pics on my Lowrance of what we were fishing today. 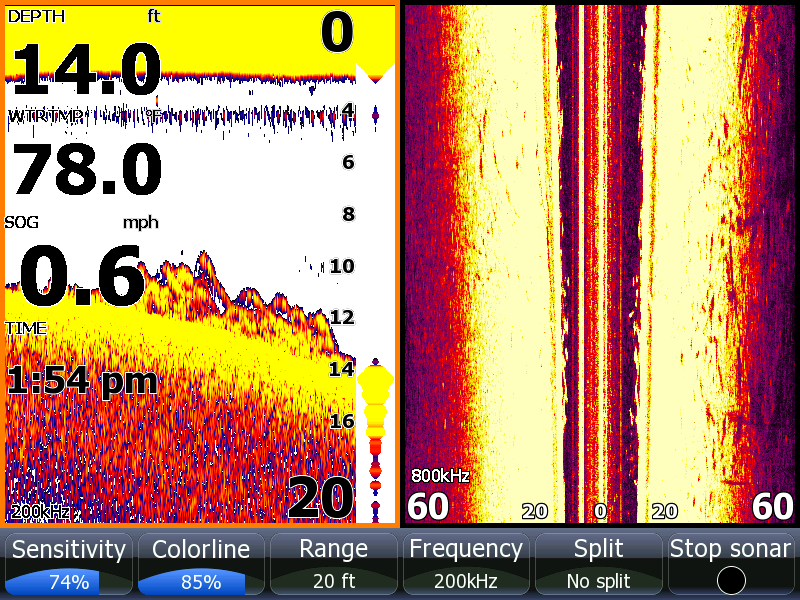 The top two pictures are of a school of Stripers over a 12 foot flat. We had gotten most of our rods in by then because of the storm. 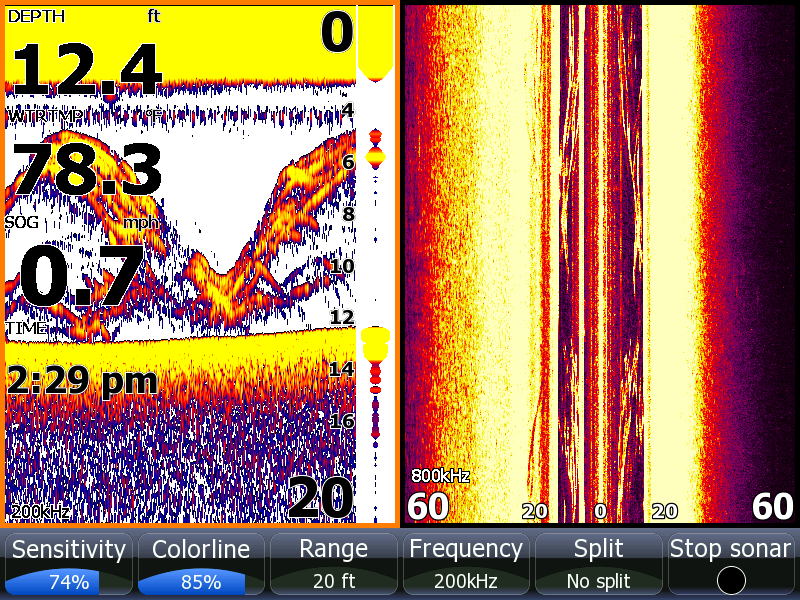 The bottom picture is Stripers hugging the bottom on a ledge where we caught some fish. This afternoon the fish went very shallow before the storm. I sent the guys home with cooler overflowing with Stripers. First I would like to thank all the followers of my journal for their concern about me not posting any thing for the last few weeks. Many of you have written wondering if I was OK or what was going on at the lake. September is a month that I usually do not fish very much. In September I try to get as much done around my farm as I can so that I can be ready to fish and hunt daily for the rest of the year. Yesterday I got my last load of firewood up [I have an outdoor furnace that I heat 2 houses with] and taken care of most of my "Honey-Doo's". I have trips scheduled for later in the week so I called a friend [Greg Whitlock of Louisa Boat and Motors] and asked him if he wanted to go out to check out the lake and find some fish for my clients. He happily agreed so we got out early this morning, caught bait and set out a spread of planner boards checking out the shallows since it has been so cool lately. After pulling boards for a couple hours with no luck I decided to make a big move and run down lake looking for schools of fish. I found what I was looking for [Picture on my Lowrance] so we set out downlines setting the baits at 18 feet deep and could not keep up with the action. We kept the first 8 fish and released all the other fish we caught to fight again. We went through a tankful of bait and were ready and happy to come off the water and get home before lunch. Greg is holding up a couple we had hooked up at the same time then released the fish back to swim away. 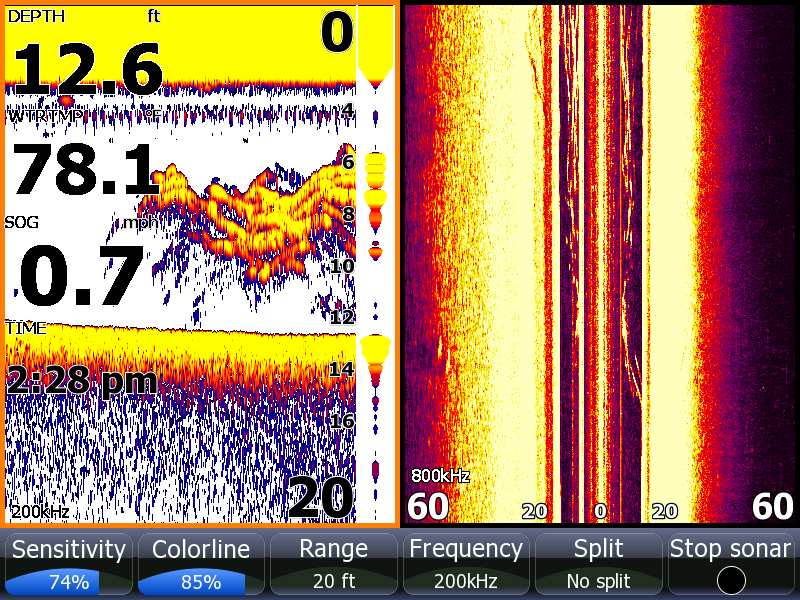 I took the picture of my Lowrance as I was walking up to put my trolling motor in the water. I turned the boat out to the left where I was seeing larger fish in deeper water as Greg tried to put down lines out but as you can imagine we could not get too many in before we started taking hits. This morning when I left the house at 4 am weather.com said there was only 20% chance of rain this morning. Well, we got all of the 20% and more. It rained almost 2 inches in a few hours. I located a couple of schools this morning before my clients couldn't take any more rain. These 2 Lowrance picture are of the same school that I followed about 3/4 of a mile and for about an hour. 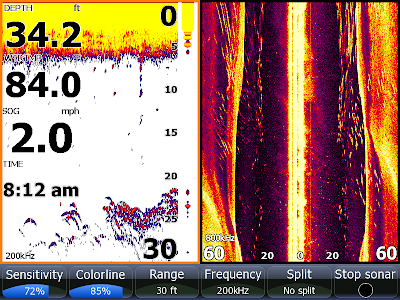 The lower picture shows 3 screens, the left screen is on bottom lock showing the bottom up to 7 feet off the bottom. 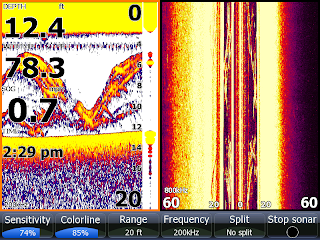 The middle screen is traditional sonar showing the fish from the top to the bottom [note the fish streaking at the surface which was actually busting bait right at the back of my boat.] The right half of the screen is side scan showing fish all the way out to 60 feet on both sides of the boat. The upper picture was taken as I was loosing the school before I had to get back on my motor and move to catch up with the school. As you can see the fish at the end of the school were punks and not worth fishing for. 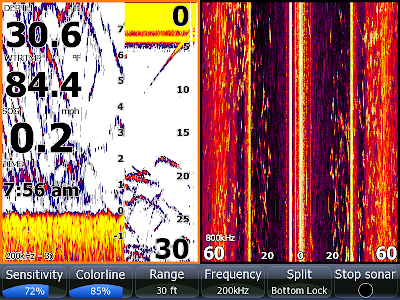 Lately when I locate the school the nicer fish have been leading the pack and much more aggressive. It was raining way too hard when we got back to the dock at 9 to take pictures of a stringer of fish.